With the invention of the chronometer in 1759, mariners were, for the first time, able to calculate longitude by finding the difference between Greenwich Mean Time and Local Time. However, the marine chronometer did not become affordable until around 1850 and so they were not widely used until about that time. It would seem therefore that, for most of the 18th. and 19th. centuries, those mariners who were unable to obtain a chronometer would be unable to calculate their longitude. However, there are other methods of calculating longitude which do not rely on the use of a chronometer and one of those that was widely used until the late 19th. century was the method of Lunar Distance. This should not be confused with the fact that, as the Earth revolves about its own axis from West to East, the celestial bodies that are visible in the sky, including the Sun and the Moon, will appear to move in the opposite direction i.e. from East to West at an approximate rate of 15o of longitude per hour. Click here for a fuller explanation of this. The navigator uses a sextant to measure the angle between the Moon and the Sun (or another celestial body); this is the lunar distance at his position. 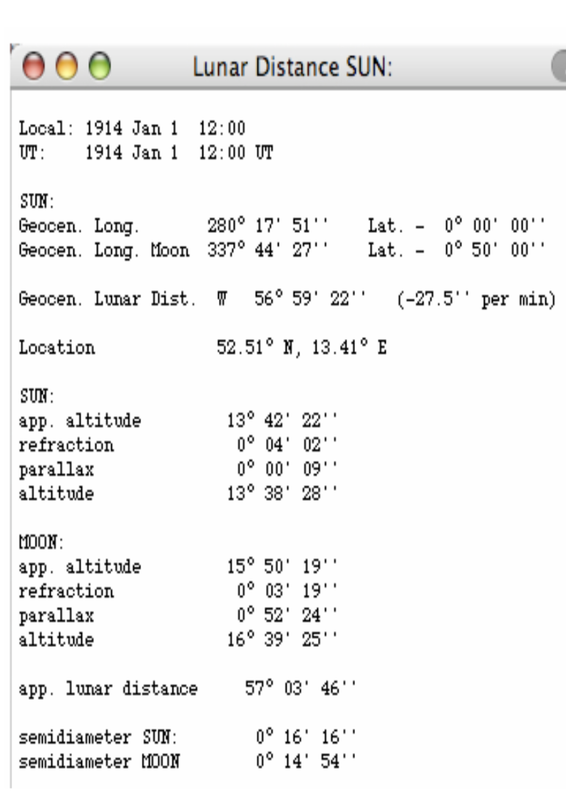 The Nautical Almanac contains a table of lunar distances and the Greenwich Mean Time at which they occur on the Greenwich Meridian (see the extract below). If the navigator measures the lunar distance at his position, he will be able to compare the result with the lunar distance at Greenwich as tabulated in the Nautical Almanac. He will then be able to calculate the difference between the two measurements. In this way, he will be able to calculate the Greenwich Mean Time and by comparing this with his local time, he will be able to calculate his longitude. Note. Local time can be calculated by one of several methods, one of which is by measuring the altitude of the Sun at noon. Since this can be checked daily, a less accurate time piece than a chronometer could be used to record local time for a 24 hour period. (In the 18th. and 19th. centuries, this could have been an hour glass). Links: Find Longitude, calculate latitude, sun as time keeper, difference in time between meridians of longitude, measuring altitude part 1, measuring altitude part 2 measuring altitude part 3. Thank you for posting all this. This all is fascinating, mathematically and historically.